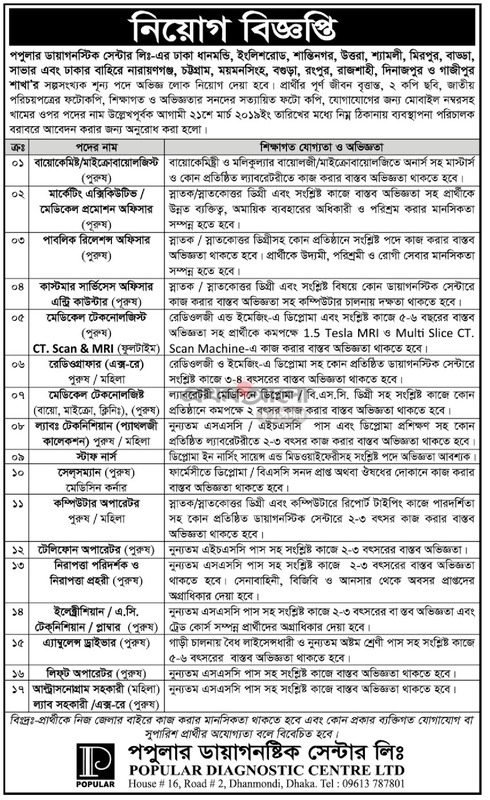 Jobs from Popular Diagnostic Center Limited has been published..Hope you will get the truth and detailed news through us..Popular Diagnostic Center Limited has circulated job circular in recent times.This is your chance to share your story and connect with job field in our country. As a hoping for a job, you’ll represent your skill and qualification. You can apply online or via email or directly through the post office. .Popular Diagnostic Center Limited authorities published the notice for jobs in their team. Our Lekhaporabd Jobs team has converted the notification into an image so that you can download and read later. Below is a short summary and you can see the full picture of the notification below. To download the image, click on the image to save image or give a screenshot. According to Popular Diagnostic, Popular Diagnostic Center Ltd. is an advanced Center for diagnostic and medical services. It is one of the prestigious diagnostic complexes of Bangladesh which started its activities in 1983. Popular Diagnostic Center Ltd. is the largest diagnostic services provider organization in private sector of the country. It is been pioneer in introducing world latest medical equipments and advanced technology to provide round the clock medical investigations and consultancy services. LEGAL STATUS Popular Diagnostic Center Ltd. is a private limited company registered with the Ministry of Health & Family Welfare, People’s Republic Govt. of Bangladesh having License No. 1275 &688.